Professor Gilderoy Lockhart, Order of Merlin- Third Class, was a wizard, a Ravenclaw student at Hogwarts School of Witchcraft and Wizardry, and later a famous wizarding celebrity who authored many books on dark creatures and his encounters with them. 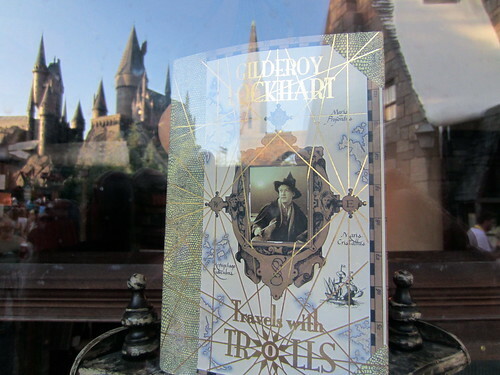 At the Wizarding World of Harry Potter theme park, you’ll find a book store storefront that includes many volumes written by Gilderoy Lockhart. The books in the window of the storefront by Gilderoy show him on the covers moving about, just like the images in Hogwarts. You’ll also see a picture of Gilderoy in a flight suit, framed and also moving. After taking many photos of these books and the picture frame, I have one that I’m going to share with you that I find particularly interesting, as you’ll see the reflection of Hogwarts in the background.